In my last post on this topic, we loaded the Airline On-Time Performance data set collected by the United States Department of Transportation into a Parquet file to greatly improve the speed at which the data can be analyzed. Now, let’s take a first look at the data by graphing the average airline-caused flight delay by airline. This is a rather straightforward analysis, but is a good one to get started with the data set. Then, in the next cell load data frames for the airline on time activity and airline meta data based on the parquet files built in the last post. Note that I am using QFS as my distributed file system. If you are using HDFS, simply update the file URLs as needed. Now we are ready to process the data. The next cell will essential do a group by and average type query, but it does some important things first for efficiency. First, we immediately select one those columns we care about from the data frame, specifically Carrier, Year, Month, and ArrDelay. This give Spark and Parquet a chance to create efficiencies by only reading the data that pertains to those columns. The second step is to filter out those rows that don’t pertain to the airlines we want to analyze. The next two groupBy and agg steps find the average delay for each airline by month. Then the query creates a new column YearMonth which is a display string for year and month, and drops the now extraneous Year and Month columns. The final step is to create of each airline’s average delay over time. Here I want to use the human readable names of each airline, so the first task is to create a name dictionary for the airlines keyed by the airline ID. Then we create the graph. In both of these steps, the Spark data frame is converted to a pandas data frame, which has the effect of collecting all of the data in theSpark data frame to the master node. Generally, you have to be careful about doing this as the master node has limited memory. Due to the concise pull of data with the initial filter step on the data frame, the data set quite easily fits within the master node’s RAM. To create the graph, I use the fairly standard matplotlib line graph. Since I have multiple airlines to graph, you will note I have to plot each airline separately into the graph. The x-axis are the year & month pairs, and these need to be converted into actual datetime objects before creating the airline specific graph line. The way to interpret correlation scores is that values close to 1 or -1 indicate strong correlation, but values close to 0 indicate little correlation. 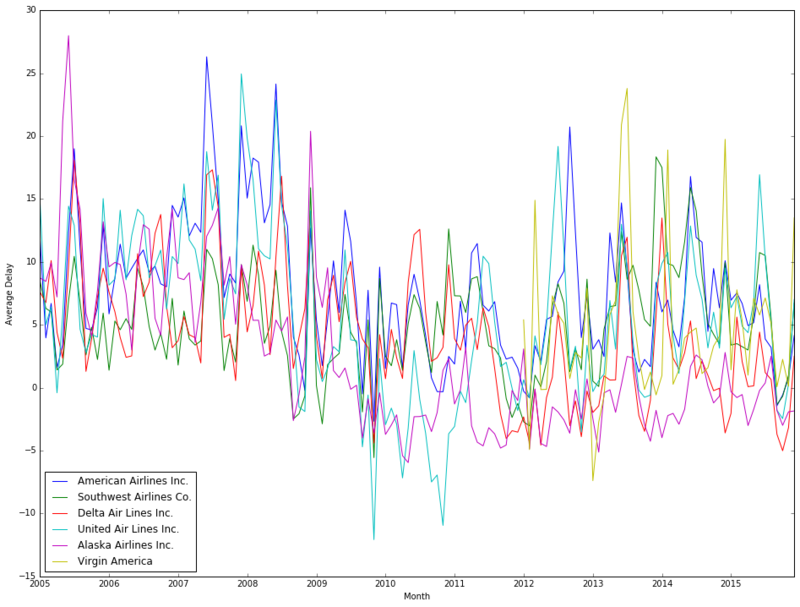 You might note is that Virgin Airlines (VX) flight delay has poor correlation with most other airlines (if you processed the same 11 year data set I did). This is primarily due to VX data only being present in the data set for the more recent years. The strongest correlation found is between American Airlines (AA) and United Airlines (UA), and the second strongest correlation is between American Airlines and Envoy Air (MQ). It is important to keep in mind that correlation is does not imply causation. That doesn’t mean there isn’t a structural relationship between the onetime performance of two airlines, just that correlation isn’t sufficient evidence say the two airlines’ on-time performance records have a link. In a future post, we will search for clues as to what that structural relationship might be (if it does exist). The Jupyter notebook behind this post can be viewed at my Github repository.